1 - Can everyone learn Sumi-e? The lessons and courses are open to all and are suitable for students who either already know the basics of sumi-e painting or are for people who have never taken a brush in their hands. Previous experience of meditation is not necessary as guidance will be given. Everyone can learn as long as they follow the spirit of the instructor and his indications are often based on intuition. The relationship between the teacher and the student is based on mutual exchange and enrichment, in which the individual relationship remains fundamental for overcoming the difficulties that each participant encounters. Unlike most of the disciplines practiced in Europe, in sumi-e there is no spirit of competition; if we think or judge in terms of good or bad, we are still far from the true spirit of sumi-e. It is necessary to give oneself to a patient work of repetition and refinement of one’s own gestures. Concentration on body posture, brush position and breathing are essential in order to practice in the right way. Students work together in small groups in stillness, silence and with an atmosphere of harmonious concentration. There is no competition in order to achieve a goal but only a patient work to develop one’s sensitivity and one’s expressiveness. Through sumi-e you can deepen the quality of being smooth and graceful. In this way, a flower, a rock or a bamboo becomes like a natural expression of your body. 2 - What is learned during a workshop ? The training course is based on the study of the traditional “Four Gentleman” which are the four main subjects of sumi-e painting: bamboo, orchid, plum tree and chrysanthemum. They represent the “ki” which is the vital energy and they also symbolize the four seasons and four phases of a person’s life. Following the ancient tradition, the first subject studied is bamboo. Bamboo embodies eternal friendship and longevity. It represents flexibility rooted in strength. It refers to an inner attitude of great flexibility that makes a person strong because, just like bamboo, when face with the events of life, they do not oppose to change, but flow with it and adapt to it. In the beginning we learn the different elements of the bamboo: cane, knots, branches and leaves. Once the student has acquired a sufficient mastery of each element, it means that they will have simultaneously refined sensitivity and consequently developed the skill of holding the brush. We will therefore be able to proceed with the composition of the first complete bamboo. In their training, each student will be able to fully embody the different principles of painting following their own rhythm and improve in the study of the “Four Gentleman”, before moving on to other subjects: plants and flowers, insects and birds, rocks. At the end of each workshop, each student will be able to produce a finished piece of rice paper that illustrates what has been learnt during these days of intense practice. 3 - Is the teaching adapted to each individual student ? Teaching is adapted to the rhythm and needs of every single student. Each of us is different depending on our previous experience, such as the education received, and the origin of the social and cultural environment. In consideration of these aspects , teaching can be described as rich and original because the advice and indications are not given in a “standardized and mechanical” way. On the contrary the instructor adapts his guidance and the subjects to be painted according to each student. Thanks to this guided teaching approach, the student is able to develop and deepen their qualities and affinities. So it is not so much a matter of learning a simple pictorial technique, but rather of “creating” together with the Master one’s own inner path, that is unique and personal. This is not an aesthetic exercise as what matters are not the lines drawn on the sheet of paper but the inner experience, the presence dedicated to the gesture, the body and the breath; making every gesture a unique gesture. 4 - What benefits does the practice offer ? We can never stress enough the importance of this method of painting still little known in the West today. Taught in the right way sumi-e stimulates the student to respect and deepen their knowledge of the different parts of the body as well as breathing. Thanks to this greater awareness of the body and one’s own gestures, acquired during practice, the student can become aware of the possible bad postures that cause pain or tension which eventually worsens over time. Therefore, the change in one’s mental attitude and the setting of a more correct, more relaxed and natural posture will favor the regular functioning of the musculoskeletal, cardiovascular and respiratory system, developing homeostasis: the natural ability of defense and self healing of the organism. You also realize that you are breathing better, that your posture is more upright and noble and that even the general state of health, including psychic balance, has improved. The practice of meditation and sumi-e develops the capacity for attention and concentration. At the same time, these practices reduce stress and anxiety in a natural and unconscious way, also allowing you to find a deeper and more restful sleep. Through greater self-confidence, better management of emotions and a more serene inner state, we can face the events of life calmly, using wisdom and experiencing the joy of simple things. HOW DOES A WORKSHOP OF SUMI-E TAKE PLACE ? 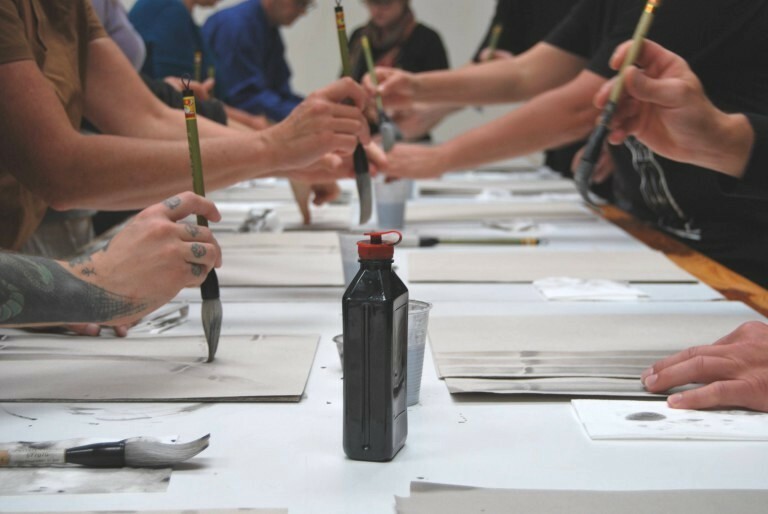 Sumi-e workshops take place throughout the year, both in Italy and in other European countries: France, Germany, the Netherlands, Switzerland. In general the organization and the program of seminars differ little from one another; it is therefore possible to describe the development of each workshop regardless of the location. Master Beppe Mokuza offers a unique experience by presenting seminars that combine the practice of Zen meditation with the practice of Sumi-e painting. Both of these disciplines come from the oriental world handed down over the centuries, from teacher to disciple which is a good way to foster self-study. The teachings and the rules are transmitted from heart to heart, at an opportune moment, in the silence of Zen meditation (zazen) or through brush strokes on rice paper. The sumi-e can be considered as a source of art therapy. This method of painting, still little known in the West, puts students in a position to deepen the awareness of their body, breathing and learning to refine more and more of the gestures that were codified in Japan by Zen monks, about five centuries ago . In a place dedicated to the practice of the Way (Dojo) you will be able to discover a new way of living, of speaking, of eating, being simply imbued by the spirit of Zen as introduced in Europe by Master Taisen Deshimaru (1914-1982), the first Zen patriarch of the West. These workshops offer everyone the opportunity to touch their inner most self and forget for a few days the daily activities, the worries and the habits that are often the source of suffering and dissatisfaction in our lives. These courses are open to all, beginners or advanced, the art of sumi-e and Zen meditation are two practices suitable for anyone who wants to question and understand oneself more deeply. This way of painting was introduced into Japan by Zen monks and it then became rapidly successful because in this painting-method, as in Zen practice, reality is expressed by reducing it to its pure, bare form. Touch-ups, additions and decorations do not enhance a work, but rather hide its true nature. Zen means meditation, concentration. The word zen derives from the Indian word dhyana and the Chinese word ch’an, which means precisely meditation. Zen is a way of vigilance and self-knowledge that is practiced in the sitting posture of Zazen, the posture of the awakening of the Shakyamuni Buddha and in all the actions of everyday life. Its origin dates back to the spiritual quest of Buddha, who lived in India 2.500 years ago. He had well understood that even by possessing everything, Man is never satisfied because his true happiness does not depend on what one has but what one is. By searching and seeing the true causes of human suffering in himself, he realized the Perfect Awakening sitting in Zazen. This Awakening was transmitted from India to China and Japan; in the U.S.A by Master Shunryu Suzuki Roshi (1955) and in Europe with the arrival of Master Taisen Deshimaru in 1967. This experience that we can directly make ourselves is at the origin of the major spiritual currents of humanity’s peace: Buddhism. Zazen is the essence of Zen. “Do zazen, calm in the dojo, abandon all negative thoughts, this joy is beyond paradise. The world pursues social profits, money, prestige and honors, good clothes and all sorts of comforts, but these pleasures do not give true peace. Run and you will be dissatisfied until death. Sitting in the dojo and practicing Zazen, concentrating on a single mind that is sometimes motionless or sometimes moving, seeing with your own eyes the deep inner wisdom, being able to observe and intimately recognize the true aspect of every action and existence, to be able to observe the balance, understand and recognize with a perfectly calm spirit. If so, your spiritual dimension is the highest in this world, it can not be compared to any other “. The program is the result of a long experience and is inspired by the Zen tradition. The daily activities have a precise rhythm that the students follow in order to concentrate on each action. The alternation between time dedicated to practice and to periods of rest give balance to the day. Each participant is invited to take an active and responsible part in the life of the community. How long could a workshop last? The teacher Beppe Mokuza directs many workshops and retreats organized in different European countries. Courses have variable duration from weekends to three or four or even nine days. The workshops that take place in Alba are organized between two weekends; it is therefore possible to participate for either the first weekend, the second or for the entire duration of the nine days workshop. Regardless of the actual schedule, arrival is normally on Friday afternoons at 17:00. There is an introduction to meditation for beginners that takes place around 17:45 – 18:00, followed by a short session of zazen. Dinner is served around 20:00. Departure is on Monday morning. The nine-day course follows the schedule described above with a one and a half day break from Thursday afternoon to all day Friday until activities resume at 18.00. During these workshops, meals are cooked by the hosts. The meals are carefully prepared following ancient instructions on food preparation: the cutting of vegetables, cooking time, the selection of colors and the union of the five basic flavors. The cuisine is vegetarian. The food is organic and possibly grown and harvested directly from the vegetable garden. Spices such as turmeric , curry, pepper, chili and aromatic herbs for example sage, rosemary, basil are chosen according to their healing and energizing qualities. It is essential that, during the workshops, the menu is balanced and provides the nutritional input necessary for the proper functioning of the body. The practice requires great concentration and energy, so the food should be light but nutritious. The preparation of meals is done with a serene and concentrated spirit that influences all the students of the course. People who have food intolerance are kindly asked to give detail at the time of enrollment. Meals are held according to the Zen tradition in an atmosphere of calm silence in order to maintain a concentrated and attentive spirit. This is the continuation and expression of the other two activities of the training course: sumi-e and zazen. Naturally, for those who come for the first time, indications and explanations of the gestures and rituals will be given, such as instruction for the singing of the sutras. According to the Zen tradition, meals are served in bowls; each student will have their own, brought from home or they can be provided. – Exercise paper: it is a special paper that has similar characteristics of absorbing of rice paper; size (40 x 35 cm), it is ideal for daily practice. – Rice paper: at the end of each stage, a sheet of rice paper previously attached to a rigid support is offered to each participant so that they can express what they have learned during the intense days of work. For those who wish, it will be possible to buy painting material during the workshop. After the meditation session, during the morning service, and during breakfast and lunch, students are invited to recite the sutras of the Zen tradition. The Sutras are texts that reproduce the teachings of the Buddha or other ancient Buddhist Masters such as Dogen. In Zen the sutras recited after meditation are the expression of one’s practice, it is both intellectual understanding and energetic vibration. Their acting, above all, like zazen, is to be one with others, abandoning one’s ego and individuality. Ceremonies are often dedicated “for the benefit of all beings”. The texts are in Sanskrit Chinese-Japanese. “Samu” known also as working meditation, is a Japanese word from the Zen dictionary which means “work for the community”. During Zen workshops or meditation retreats, students have the opportunity to contribute to community life by performing simple daily tasks such as washing dishes, cleaning, cleaning and cutting vegetables, etc. This voluntary work is carried out energetically in a spirit of gift and concentration. Samu for its concrete aspect is one of the great value of Zen practice. It could also be called “meditation in action”. Prices vary depending on the location and depending on the duration of the workshop. For all information regarding the cost of the courses and accommodation, please contact via e-mail or telephone. The Zen Association “Bodai Dojo” was formed in Alba in 2008 as a “non-profit” association to promote Zen meditation and sumi-e painting at local, national and European level. The “Bodai Dojo” Zen dojo of Alba, inaugurated in September 2009, is directed by the monk Beppe Mokuza Signoritti, a disciple of the master Roland Yuno Rech and is located in Alba (CN). The dojo is close to the city center and the train station, it is located in a quiet residential area. The Langhe is one of the most beautiful areas of Piedmont, between the provinces of Cuneo and Asti, characterized by soft hills, it is famous for its food and wine tourism. It is a land where the production of wine has an ancient tradition. The Langhe were once very disputed, divided into many small fiefdoms fighting each other, factions that have left behind a large number of medieval castles, towers and small forts dotting towns and cities. Alba is located in the heart of the Langhe, a region declared a World Heritage Site by UNESCO in 2014. The town origin dates back to Roman times, Alba has kept its charm thanks to towers, palaces and medieval streets in excellent condition. It owes its fame in part to the “International White Truffle Fair of Alba” and to the many other events that take place throughout the year. How to reach Alba ? – Turin Porta Susa and Turin Lingotto: direct train to Alba. – From Turin: GTT Torino-Alba bus line. Departure at the Piazza Carducci or Lingotto stop – Alba terminus.